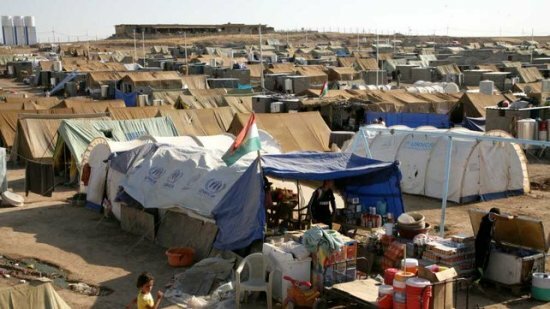 The Commandery of North Carolina of the US Grand Priory of the Hospitaller Order of Saint Lazarus of Jerusalem is proud to announce that it has sent a shipment of emergency blankets to the refugee camps outside of Aleppo, Syria. The humanitarian aid was sent in conjunction with its partner organization, Humanity Healing International. Earlier this month, the Order and Humanity Healing sent a shipment of children’s and women’s gloves to these camps. The Syrian refugees are facing the hardship of a brutal winter, with children, the elderly and women being hit the hardest. “The blankets are very much needed as many refugees are lacking even the most basic things”, stated Samir Jesús Gavira Estévez, who will be distributing the emergency blankets to the refugees on behalf of the organizations. “The very origins of the Hospitaller Order are linked to this region of the world and it is supremely fitting that in the modern age, we are able to respond to the call to mitigate the suffering of war refugees in Syria”, stated Dame Karen Cantrell, Secretary General of the US Grand Priory. Dame Cantrell continues, “This shipment is further evidence of the great success of the formal Treaty Alliance with Humanity Healing International that we forged in September 2012 and I look forward to sharing the success of other initiatives currently in the works”. “Humanity Healing is both proud and grateful to be working with the Hospitaller Order of Saint Lazarus of Jerusalem. By combining our efforts, we are able to make a significantly greater contribution towards compassionate assistance in the plight of those displaced by the violence in Syria”, stated Humanity Healing International CEO Christopher Buck. According to UNHCR data, the total number of Syrian refugees reached more than 408,000 registered in December 2012, mostly residing in Turkey, Jordan, Lebanon and Iraq (including Iraqi Kurdistan). The number of Syrian refugees in Turkey reached 135,519 registered; 8,852 in Iraq proper and additional 54,000 in Iraqi Kurdistan; 109,081 registered in Lebanon, with 41,712 people awaiting registration; 100,368 registered in Jordan, with 41,524 Syrians awaiting registration. There are also 12,915 people registered in Egypt as of December 30, 2012, and about at least 150,000 residing in the country. The violence that has torn the country has created almost 600,000 refugees, according to the United Nations High Commissioner for Refugees as of 2013. “Every act of Compassion, no matter where in the world it takes place, raises each and every one of us”, stated Liane Queiroz, Commander of North Carolina, “It is both a sacred duty and a great privilege to serve towards the eradication of the suffering of others”. Support the Humanitarian Outreaches of the Hospitaller Order of Saint Lazarus of Jerusalem by donating to the Order. Contribute on a higher level through your time and talents by joining the Order.